Soil Testing, Seed Treatment, & Fertilizer Application - Bunker Hill Supply Co.
Bunker Hill is equipped with a wide variety of application equipment for your dry, liquid, and pesticide applications. Variable Rate Fertilizer and Lime has become a common practice for crop production, it allows farmers to apply different rates of fertilizer at each location across the field. Bunker Hill has the variable rate equipment to meet your needs. 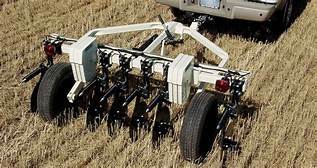 Our Veris equipment can accurately map soil variability to give you the information you need to get the most out of your soil. Soil testing is a way to find out which nutrients your field, yard, or garden lacks so that you can apply the right fertilizer. Bunker Hill offers random field, yard, and garden average soil testing to meet your needs. Treatment of seed is very important to plant health, whether it be protection from bugs or diseases. Bunker Hill offers Cruiser Maxx Plus and Optimize for treatment of soybeans and offers Dividend Extreme for treatment of wheat. Bunker Hill offers bulk soybean delivery to your farm or field with our seed conveyor tender truck. Bunker Hill offers custom liquid sidedress application. Bunker Hill offers custom NH3 application. Contact any of our locations to save time, energy, and money. Let Bunker Hill take care of your aerial application of fungicide. We will work closely with local aerial applicators to provide our customers with this service.